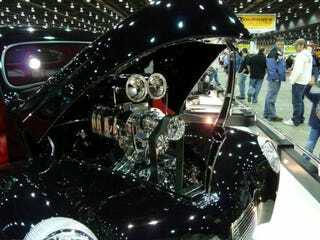 Hot rodders best be careful, or the once lusted after 1941 Willys Coupe will be the next '32 Ford of the rodding world. We know they've got a nice stout shape and wear fat racing slicks with a certain style few other cars can, but as often as we see them, you'd think they never went out of production. This particular '41Coupe is under the stewardship of Joseph Mouton Jr. who hails from New Orleans. After overlooking the massively supercharged 502 V8 mill, the car has got some real nice details throughout. Even though it's a fiberglass body, the execution is well played. The one off grille is flanked by custom headlights, and the custom "W" engraved hood stand are all pretty neat pieces. The interior is as red as an Arizona sunset and all of those wheels are deep enough to get lost in. Overall a very nice interpretation of the Willys form.